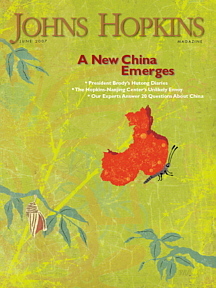 When President Brody and his wife, Wendy, went to China to learn Mandarin, they immersed themselves in the sights, sounds, and smells of Beijing. Launching the Hopkins-Nanjing Center took a bold vision, strategic thinking, and a lot of on-site work by an unlikely envoy: a professor of particle physics. We ask faculty members, alumni, and students to share their experiences, opinions, and expertise on what's under way in China and what it means for the world. By turning his zoom lens on some familiar Homewood campus structures, Will Kirk showcased the lovely, intricate design of their less-than-familiar details. After 26 years, Stephen Dixon has retired from the Writing Seminars — but not from writing. He says, "How many books can you read without wanting to write one?" Public Health: Are smaller airplanes less safe? The Big Question: What's the Best Way to Throw a Frisbee?